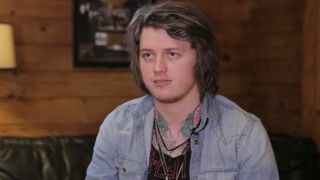 Asking Alexandria guitarist Ben Bruce has praised producer Joey Sturgis for creating a “comfortable environment” in the studio. Sturgis has been behind the desk on the band’s upcoming album The Black, which is out tomorrow (March 25). And Bruce says the fact they’ve become friends with the producer over the years made recording their first album with frontman Denis Stoff a pleasure. The guitarist says: “Recording with Joey is almost natural at this point. I don’t think I’ve ever recorded with another producer properly since the start of this band. “Over the years it’s got easier as we’ve grown to become friends and no just co-workers. It’s become a very comfortable environment for me to work in. Asking Alexandria begin a world tour on April 3 in support of the new record, including a run of North American dates with Bullet For My Valentine.